The Chapel Hill/Orange County Visitors Bureau hosted an IGLTA FAM for about 30 people in September, and it definitely opened my eyes to the area's LGBT-welcoming attitude and overwhelming friendliness. Charming Chapel Hill is the type of place where people seem startled if you don't greet them with a big smile and wave – a bit of culture shock for this D.C. resident! The city is surprisingly liberal with great quality of life (and an openly gay city council member, too). Down-home Southern cooking took a starring role in our tour, particularly at Crook's Corner where we enjoyed a meal of cold fried chicken, aka "the church picnic." At A Southern Season, we were treated to culinary lessons in a studio worthy of a Food Network show. (They had cameras projecting the chef's moves onto TVs for easier viewing.) Next to the cooking school is A Southern Season's jaw-dropping warehouse of a gourmet market, kind of like a Whole Foods on steroids. 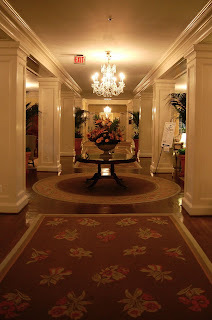 I stayed at The Carolina Inn, which was built in 1924 to provide comfortable accommodations to University of North Carolina alumni and later restored as an elegant hotel. It was like being transported back in time. When cocktail hour beckoned, a group of us went to the Orange County Social Club in neighboring Carrboro. This bohemian town is full of art studios, music venues and coffeehouses and has an equally liberal vibe. In fact, Amanda Ashley, who puts the "T" in LGBT, is running for Carrboro mayor this year. If you've never thought about North Carolina as a gay destination, it's time to think again. Aaron makes quite the fabulous critic & NC will alwayz love him!